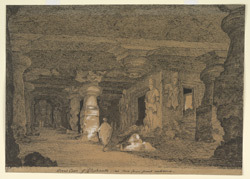 Drawing in crayon heightened with white on grey paper of the great Shiva cave temple at Elephanta, by G. Ridge, dated March 1829. The small island of Elephanta, off the coast of Bombay, is celebrated for the great cave temple dedicated to Shiva that was excavated into the cliff above the water during the Kalachuri period in the sixth century AD. The vast scale of the excavation and the complexity of the plan make it one of the greatest achievement of rock-cut architecture. The principal shrine is flanked by two excavated courtyards and is entered on the east, north and west. The east entrance leads to the sanctuary, depicted in this view, situated to the west of a large pillared hall. The square sanctuary contains the lingam, the aniconic symbol of Shiva. The four entrance doorways are flanked by large figures of dvarapalas or guardian figures. The north entrance leads towards the great triple-headed bust of Shiva, seen in the background in the drawing, which dominates the interior.